When I was a kid, learning to drive a standard transmission vehicle, my dad said something that has stuck with me to this very day. When trying to get that old, beat-up 1955 Chevrolet pickup into third gear from second, it would make a terrible grinding noise to which my old man would reply, "Son, if you can't find it, grind it!" I would never forget that statement, and I often relate it to my poker play. This may sound a bit ridiculous, and contrary to what you may be thinking, it has more to do with the gear changes, than the actual grind, no pun intended. To be a successful poker player, you must be able to adapt to your surroundings and make subtle strategic adjustments all while in the midst of a war for stacks. It can oftentimes be very difficult to step out of your modus operandi and use a totally new style of play in the middle of a game, but this is exactly what most professional poker players do on a regular basis. If you have watched any amount of live poker, and I don't mean just final table action of the WPT on the Travel Channel or the WSOP on ESPN, you have likely seen this happen more times than you can count. Only with the introduction of the hole card camera equipped poker tables have we been allowed to watch these professionals at work. 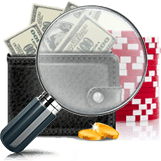 Being able to make these adjustments to your play on the fly like this, are vital to your success, whether you play cash games or tournaments in online poker. 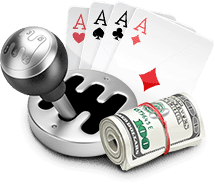 Introducing this strategy of "changing gears" into your online poker play is important for several reasons, but the most important one in my opinion is that it prevents you from becoming predictable at the poker table. One of the biggest mistakes players make is that they get stuck in a rut of only playing premium hands. From a strategic standpoint, there is nothing wrong with playing premium hands; in fact, if you're a novice in the game then you should basically stick to playing premium hands. In the majority of low stakes games you'll play, players around you won't be focusing on your moves. Because they are simply trying to play the hands they're dealt, you can play your own in the best way possible and leave your opponents to worry about their own. However, as you'll also know, poker is all about levels and these are both literal and metaphorical. Essentially, the higher up the poker ladder you climb (i.e. 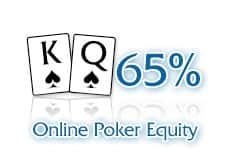 buy-in levels), the more your opponents will think about situations. 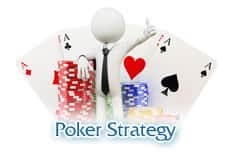 Known as levels of analysis, mid and high stakes poker players will basically move away from focusing on their hand and start to focus on a range of additional variables. Because of this, you need to be much more aware of your own image when you play higher stakes games. In fact, with regards to this subject alone, there are actually levels when it comes to your image. 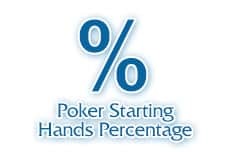 On a basic level, the way you play will give off a certain image and this will have certain repercussions at the table. . For example, if you played very few hands and only showed premium holdings at the river you'd be viewed as an extremely tight player and get fewer callers when you raise a pot. This is the first level of analysis you need to understand when you consider your own image. The second level involves thinking about the moves you can make when you have a certain image. So, if you're deemed a tight player, then it's possible for you to make more bluffs because people will respect your bets. Finally, the third level of analysis is how your image will change once you start changing gears. This requires you to not only spot a change in your opponents' attitudes towards you before it happens, but predict how they will react and adjust accordingly. To put all this in simple terms: changing gears is like a game of cat and mouse and it's important for you to constantly shift positions so that you continue to be evasive mouse that the cat can't catch. Before you can start changing gears at the poker table, you need to know the gear you're in at all times. The best way to keep track of your style at a particular time is now what your starting point is. If you know you're a tight player then consider your average starting range (which will likely be pocket nines+ and AQ+) before you ante-up. Similarly, if you're a loose player, look at the hands you usually raise pots with and then from this point look at how you can decrease or increase your range in order to "change gears." In poker you always want to know where you stand and raising with these hands will give you more insight into what the other players are holding. Indeed, cold calling is only going to allow someone else to see a flop for free and chances are that they are holding as good or better cards than you. When faced with a re-raise before the flop in this range it's easy to cut and run with a many of the hands. Although you don't want to be doing this too often, the ability to fold when you receive too much pressure pre-flop (especially when you're out of position) is crucial in poker. For this reason, I like to open a range that isn't too wide as it not only reduces the number of times I have to raise and fold (something that happens when people play a wide range), but it reduces the number of times my opponents will want to raise my bets. OK, so now you know why you need to change gears and how you can start switching your playing style, the other thing you need to take into consideration is your stack and those around you; especially if you're in a tournament. Of course, stacks are also important in cash games; however, with the ability to top up your stack at any time, it's not as important to consider these variables in such as setting. However, if you're in a tournament and you're one of the short stacks, the last thing you want to do is change gears and become a loose player just because you don't want to appear tight. Indeed, playing a bunch of pots with marginal hands when a small raise is equal to a good percentage of your stack is suicidal. This is where you have to balance reality with perception. As we've said, changing gears is like a game of cat and mouse in your mind. In technical terms, this is known as meta game. However, changing gears isn't all about meta game. When you're in a tournament the conditions around you are constantly changing (opponent's, stacks, blinds etc), and these will also factor into your decision making. 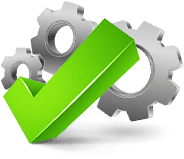 Essentially, you have to balance meta game and practical dynamics in order to assess when you should and shouldn't change gears. Therefore, as a short stack you won't be able to change gears as much as you'd like because your stack won't allow you. In contrast, when you're the chip leader, making these changes becomes easier. When you find yourself in that position you can afford to throw out a lot of small bets, you can change gears and become a lot looser and pressure those around you a lot more. Another variable you need to consider is your table. If you've been with the same players for a long time then you can change gears and thwart their expectations. However, if you've just been moved to a new table, you can't start switching things up straight away. You first need to make an impression on those around you before you can start subverting their expectations and making moves on them. Playing middle to low pairs and suited connectors can be a great range of hands to use if you want to mix up your game and change gears. In the first instalment of this article I recommended calling with these marginal hands from late position when one or two players have limped in before you and folding them to another raise. While this is a sound strategy, and one that I use quite often, there are other ways to play these hands that can result in greater rewards. Assuming the conditions (i.e. your image0 are right, it's possible to call a bet with a small pair or suited connectors. I tend to play suited connectors with the low card being an eight (occasionally I'll play 6-7 or 7-8). The reason for this is that if you make your hand (i.e. a flush or straight) it is less likely to be on the lower side of the spectrum. For example, if you play 4d-5d, and the flop comes three diamonds, you made a flush, but it is a weak and vulnerable. Similarly, making a straight with a hand such as 4d-5d on a board of 6-7-8 could leave you dominated by a hand such as 9-T. 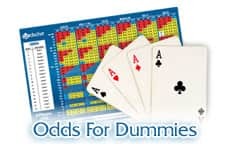 If you're able to start playing suited connectors in this way, you'll not only make more winning hands, but you'll become a much harder player to read. Indeed, if you're a naturally tight player, you can add these hands into your range when necessary and you'll have naturally "changed gears" without missing a beat. Remember, in poker, the bottom line is value. You must constantly ask yourself: "what is the expected value of the play I am about to make?" Will losing three bets or three times the big blind make me more money over the course of the night or should I just fold? If I make a raise here will it affect my image? You always want to make plays that give you a long-term advantage. This is why I place so much emphasis on not being trapped into one style of play. If I can win (or even lose) a pot here and there on a marginal hand, there is always that shred of doubt in my opponent's mind and it's this doubt I can capitalise on and, therefore, profit from. Any changes you make in the moment aren't designed to be permanent; however, you should be throwing them in here and there in order to keep your opponents guessing.